Hello! Happy October! Are you suffering from a World Card Making Day hangover this AM? What a fun celebration we had! I hope you enjoyed the ideas shared and walked away inspired. 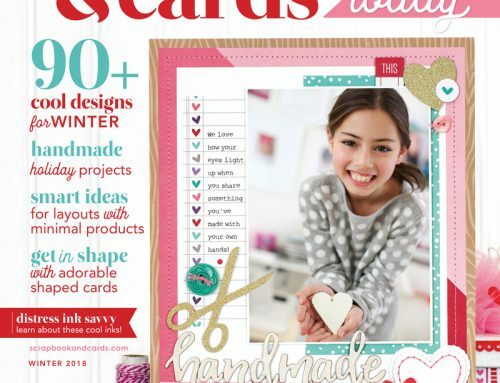 If you’re still seeking project idea and inspiration, our Fall 2015 issue of Scrapbook & Cards Today is here for you. I’m here to give you just a taste of what this hearty issue has in store. Before we begin, I’d like to remind you that you can download a digital copy of the issue for free right now on our website HERE. Or if you prefer print, you can put your order for that in here. 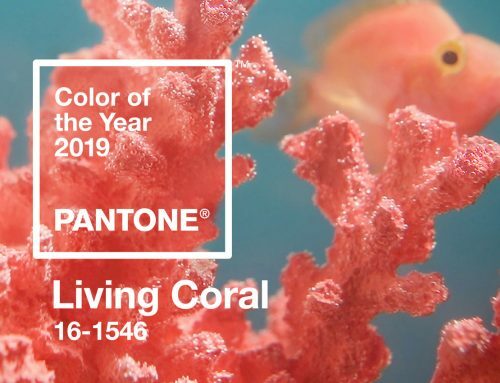 Being a product nut, I’m always drawn to this column, where we highlight some of the latest and greatest on the market. Have you had a chance to peruse the ten items being featured this month? What’s your favourite? What types of products would you like to see more of in future issues? I’m personally quite taken with the Harvest Wood Mounted Stamps by Pebbles. Marla used them to create this delightful ensemble. I want to get them and create recipe cards for my family this Thanksgiving. I just adore this feature, which includes a variety of gratitude mini albums. With both pre-made album options and DIY choices, you’re sure to find an album that speaks to you. I just adore creating albums and cards from large shipping tags, so this album from Maggie Holmes very much catches my eye. But it’s absolutely impossible to pick a single favourite in this feature. Every album has something wonderful to offer. On the pre-made end of the spectrum, I find something new and wonderful to love about this design by Nancy Damiano each time I look at it. She used the Memory Dex by Heidi Swapp—love it! Jennifer McGuire does it again. This time her technique focus is on heat embossing and she has three approaches to taking this trick to the next level. I can’t wait to try the technique demonstrated on this card—colour-gradiant embossing. Isn’t her embossed background attractive? We love hearing from you! As I mentioned before, I’d be interested to know what kinds of products you like to see featured. Are you a paper geek? Maybe stamps are more your thang. I’d also like to know what types of techniques you find intriguing. Is there something in particular you’d like to learn more about? Believe it or not, we’re about to begin editorial planning for the 2016 year, and your thoughts would be greatly appreciated. 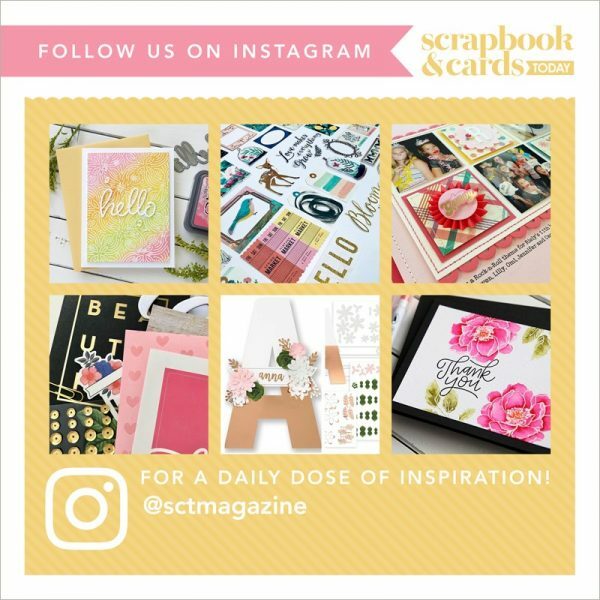 Feel free to leave them as a comment here or send an email to editor@scrapbookandcards.com. You bet we’ll read them. Thanks and happy Magazine Monday! The new Issue looks awesome!! 10 Most Wanted is one of my favorites also! I love seeing what is hot right now! I would love to see a Totally Techniques series with an online video that goes with the article. You would have the link in the article so that the visual learners can benefit also. Maybe even a series showing how you can use a certain product in numerous different ways and have a contest using those techniques. Just a couple ideas that I would like to see in your magazine! Thanks for letting me give input! HELLO, JUST CHECKING IN WITH THE MONDAY EDITION! I love paper, I would love to see different ways to use badges or the talk bubbles in scrapbooking.. I love seeing products from new companies and innovative new products from already established ones. For example, the Bo bunny stencils and glitter pastes, and hearing about Hazel and Ruby – stuff I wouldn’t know otherwise. I love seeing all the new products. Your tips are so wonderful!! I always have a hard time with colouring and shading. Its probably been covered here before, but I’m trying my hand at it more now and would be interested in any techniques you have to share 🙂 Thanks! I would love to see an article/ post about tools! What does the SCT team use for paper trimmers? That kind of thing. Love the 10 most wanted because it gives me an idea for something new to try. I’d love to see some water color techniques and coloring tips as well. Your magazine always teaches me something new each time I read through it. There are so many things to love about the Fall issue! I have learned so much about new products as well as different companies from both the magazine and this blog. Thank you! Being fairly new to paper crafting, I would love to know more about the tried and true tools/products that the designers just can’t live without. Most techniques are new to me so I am happy to learn anything and everything from your wonderful Design Team. It is plain to see how much you keep your readers in mind as you put together each issue. You really do care and that shines through in all the fabulous work that you do. Keep up the excellent work! I love the section with sketches written by Cathy Zielske. I also appreciate the 8.5 x 11 size layouts that you have included in this edition, and hope that you will continue to feature some of that size each time. i love new stamps and to see how they’re used and i love seeing new and different embellies. right now, i’m loving the printed vellum at Pretty Little Studios–gorgeous! Loved the gradient embossing technique! All the tips and techniques were awesome! 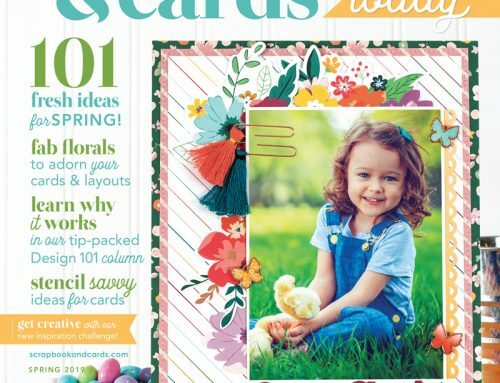 I love seeing the newest and latest products, especially dies and coordinating stamps for making cards! The patterned paper collections! Fresh ideas on using product of all kinds! Like ten different ways to use the same product, to think outside the box, if you will. Have you ever thought about finding some loyal fans that have never tried a certain technique before, supplying them with the products they need, having the create something, and the telling about their experiences? What they did wrong, what they did well, what they would do differently, etc.? I love all the inspiration your team gives, but I would also love hearing from people like me who might be apprehensive to try something for whatever the reason! Also, would it be possible to make the classes available online, for a cost, from your Crop and Creates? I cannot afford to go to a Crop And Create, but would love to take the classes! Thank you for taking the time to read my suggestions! Your magazines, blog, etc. are just amazing! I am so blessed to have found them! Thank you! ? I love anything you show about scrapbooking. It seems there is less and less for inspiration in scrapbooking. 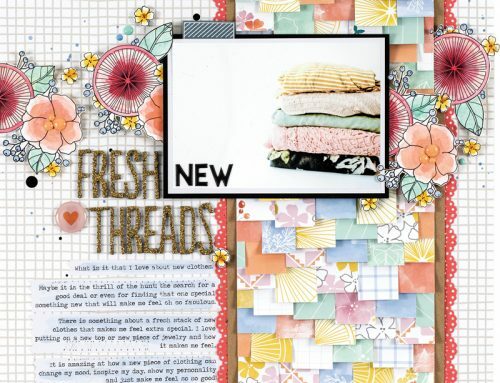 While I love making cards, I love scrapping, too! !